Freeport, Defuniak Springs, Crestview, Santa Rosa Beach, Panama City and Panama City Beach are the core areas but can make arrangements to travel within the Florida Panhandle and Southern Alabama. I work on a Reward Basis… that means you pay me what it's worth to you and what you can afford, for me to come out and find your lost items. I do have a call out fee to cover my gas & tolls and parking contact me to discuss. Land, Sand and Less than knee deep water. I have been detecting for about 12 years now. I started with a very basic and cheap pawn shop detector down on the treasure coast of Florida and over the years I have upgraded my detector to keep up with my experience and to allow me to venture in to more types of detecting grounds. 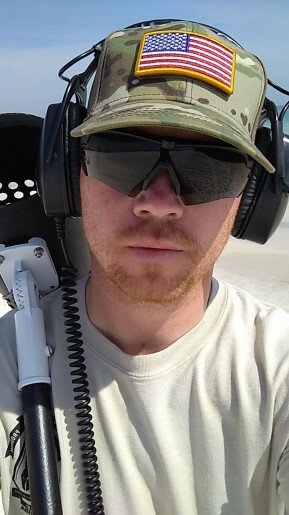 I am currently in the Florida Army National Guard and in between drill weekends I really enjoy detecting for old coins and other assorted bits of history hidden beneath our feet. My goal is to put my detector and experience to work and help others recover what they have lost and at the same time make a little bit of beer money. Whether it be a set of keys lost during a night out on the beach that resembled Kenny Chesney's song "Got a Little Crazy", a wedding ring that "slipped off" (that would be hard to explain to your better half), or a family heirloom that can never be replaced. If its metal then there is a good chance it can be found and I am willing to put the coil to the soil.